Since my first playthrough of Pokémon Blue back in 1998, I’ve had a bit of an on-again, off-again relationship with Game Freak’s monster-collecting magnum opus. I certainly consider myself to be a fan, but I haven’t finished a main game since SoulSilver, and a 2016 summer spent scouring the countryside for Kanto critters in Pokémon GO is the most time I’ve spent with the series in years. Perhaps that’s why I was so intrigued when Nintendo announced the seemingly back-to-basics Pokémon Let’s Go: Pikachu and Eevee ahead of E3, and why these twin titles were the games I was most eager to get my hands on during our booth tour at this year’s show. I mean that especially literally, too, because of how excited I was to try out the games’ bespoke controller, the Poké Ball Plus. 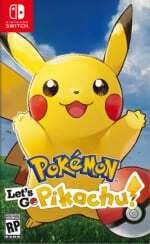 Once at Nintendo’s booth, our demo time with Let’s Go: Pikachu found us traipsing through a recognisably familiar Viridian Forest; laid out just as I remember it from the Game Boy days, the presentation popped with a smooth, stylised look and a scale that felt comfortably anchored in the series’ 8-bit beginnings. As I watched the rest of the Nintendo Life crew play, I thought that Let’s Go looked pleasant, if a bit safe, but that initial evaluation changed entirely when our Nintendo rep asked if I wanted to give it a try, and handed me the Poké Ball Plus. 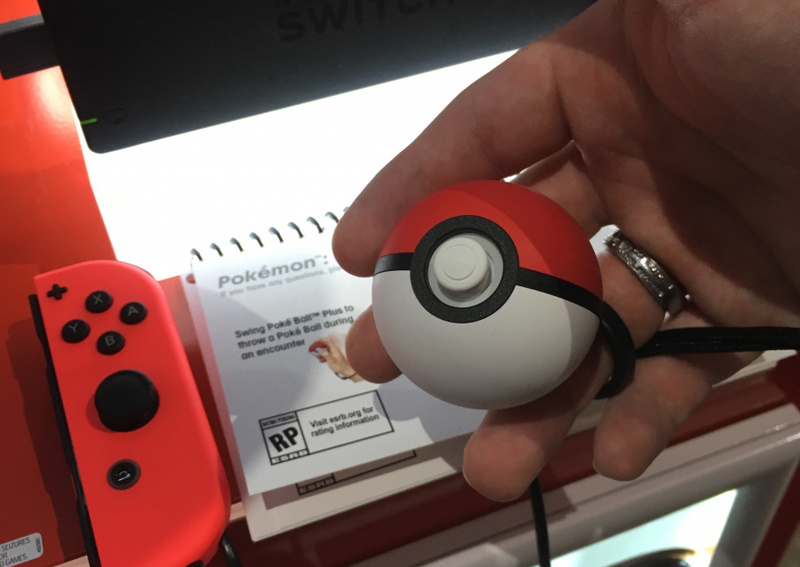 About the size of a satsuma, with a healthy heft and a lovely matte finish, the Poké Ball Plus acts as an optional all-in-one control method for Pokémon Let’s Go, and it feels absolutely fantastic to hold and use. The Poké Ball’s iconic front ‘button’ has been reimagined here as a short, clickable analogue stick, while the smooth top of the sphere hides a second button. 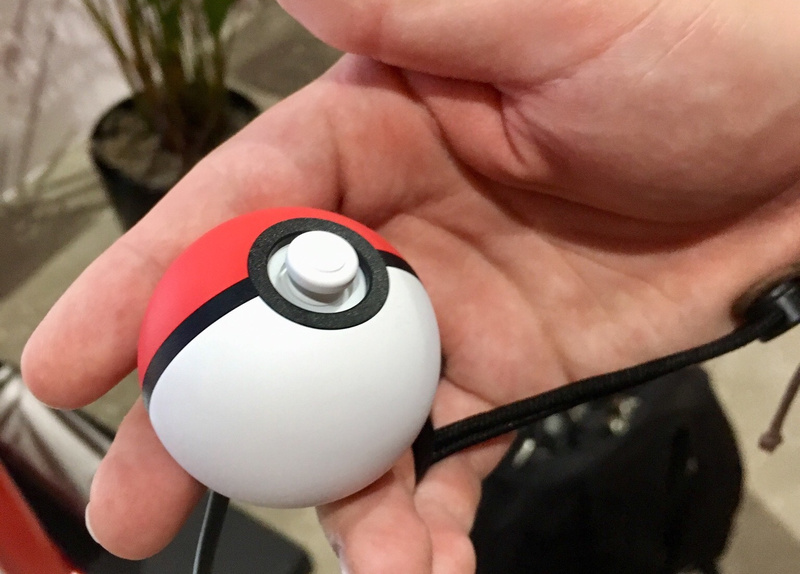 Inside, the Poké Ball contains an assortment of impressive features put to creative in-game use, including a speaker, HD rumble and a gyroscopic sensor. Controlling Let’s Go with this powered-up Poké Ball is a joy. On-field, the stick moves your trainer, while pushing it in serves as an ‘A’ button-equivalent, and the button on top acts as a ‘cancel’ command; those few inputs are really all you need for a turn-based adventure, and it was wonderful to be able to just relax my arm and navigate the world via Poké Ball. It felt natural to rest my thumb on the stick and my index finger on the top button, and the setup happily reminded me of the one-handed controllers made for JRPGs that had a brief boom in the PSOne era. The analogue stick also has a surprisingly comfortable range of travel, and it clicks in softly, so that it feels more like pressing a DS Lite button than clicking the sticks on a Switch Joy Con or Pro Controller; selecting moves, using items, and navigating menus all felt effortless and easy with the Poké Ball Plus. 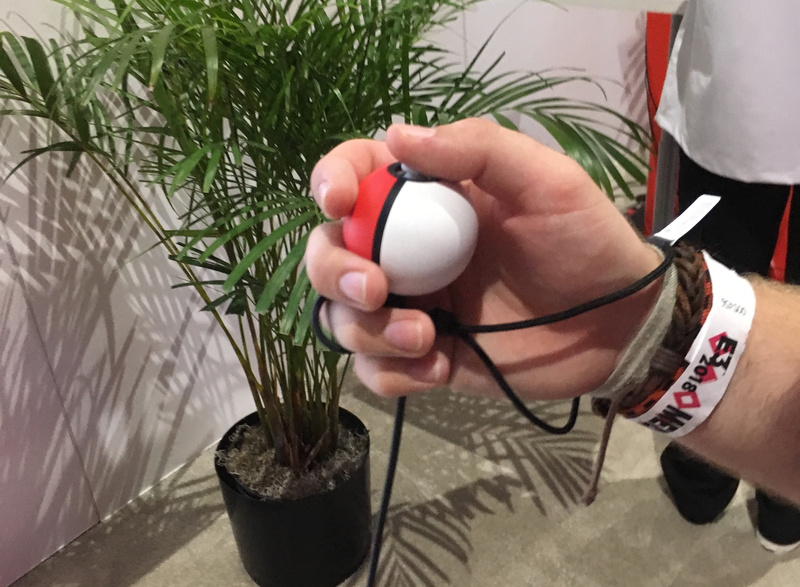 Of course, the Poké Ball Plus goes above and beyond earlier one-handed controllers thanks to all that added tech inside, and that became readily apparent in our demo as soon as I encountered my first wild Pokémon. Once your trainer runs into a Pokémon in its natural habitat (tall grass, of course), the view switches to a Pokémon GO-style capture sequence. Instead of fighting to whittle down the wild Pokémon’s health, Let’s Go takes a much more humane approach to taming based on the mobile hit: you simply throw Poké Balls at the circular target surrounding the Pokémon, which closes in on itself continuously. Green circles indicate that a Pokémon will be easier to catch than red circles — you can butter them up with berries to affect this, as in Pokémon GO — and the smaller the circle, the better the catch. 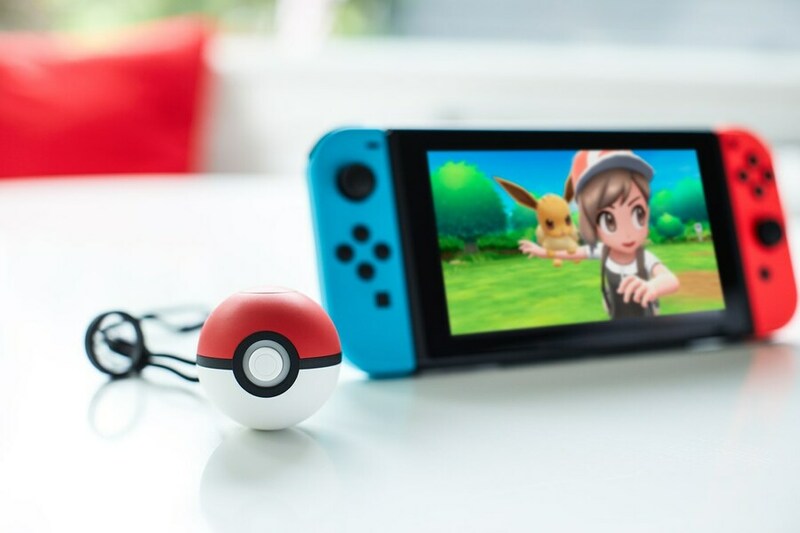 Instead of flicking the screen or hitting a button, however, using the Poké Ball Plus means you’ll actually wind up and ‘throw’ the ball at your new friend, and that tactile experience felt fantastic. While the wrist-strap our Nintendo rep insisted we wear prevented the ball from physically flying at the on-screen Pokémon, it really did feel like an actual toss — overhand, underhand, and spectacularly off-target swings were all transferred faithfully to the screen, and the smooth motion controls made aiming for the Pokémon an enjoyable act in and of itself. Running around via Poké-nub and throwing the ball to catch both felt great, but what really sold me was the sound. After I caught my first Pokémon — a Metapod — and felt the pleasant ‘1, 2, click!’ of a successful catch in the Poké Ball’s HD Rumble, our Nintendo rep suggested that I hold it up to my ear and shake it. I did, and even in the noisy chaos of the E3 showfloor, I heard the unmistakable call of my new Bug-type echoing sweetly from within the ball. It’s hard to overstate just how magical that felt in the moment, and I spent the next several minutes obsessed, capturing different Pokémon to hear their unique calls in ‘real-life’ from the palm of my hand. Rather than a mind-blowing, jaw-dropping reinvention of the franchise, Pokémon Let’s Go feels like a retelling, filled in and fleshed out with all the little details I was imagining while playing Pokémon Blue on my Game Boy Pocket in 1998. The fact that it can be controlled purely by Poké Ball makes that even more amazing, and that tangible connection — from the satisfying swing of the toss to the absolute magic of hearing a newly-caught Pokémon inside — is something I couldn’t have even imagined back then. Nintendo’s captured something special with Let’s Go and the Poké Ball Plus, and I can’t wait to set off on the full adventure, Poké Ball in hand. I'm starting to get excited for these games. Hopefully those pokeball joycons won't be too hard to come by. The Pokeball Plus bundle shall be mine. @peanutbuttercup Your avatar took me by surprise, looks just like my wife's, which I probably haven't seen in 3 or 4 years. Nice to read a hands-on review. The Pokemon noises inside the ball may sell if for my kids who were otherwise put off by the price of a full game for a ball. Somebody should ask Nintneod if the balls are upgradeable via update in case they add more Pokemon into the game later. I hope the Pokeball can be used for another Switch games, for example throwing punch in ARMS or use it for 1-2-Switch. I hope the Pokemon inside will not get upset if i use the Pokeball for NON Pokemon Let's Go games. I hope the full Pokemon game next year retains optional support for the controller. I was never a big fan of a custom controller for one title. Still gonna buy it. But I understand people with less money to spare not liking it. @Anti-Matter I think they said the balls can be used with Pokemon Go on mobile, which would mean a lot more Pokemon than are currently in the Switch Go games. I'm not sure it has enough buttons to be used as a regular Joycon but I wouldn't be surprised if they simplify the gen 8 game to use it. Actually I'd be surprised if ii didn't work with the Gen 8 game. Maybe that game will give the option to fight or capture wild Pokemon? Some games have optional motion controls, why not Pokemon? You just know there not gonna be enough of these at launch. Honestly can't wait for this. I have Let's Go Pikachu preordered for myself and Let's Go Eevee preordered for my partner. We both go out and play Pokémon GO whenever we can and we've both played the series since the Game Boy originals. Pokémon Yellow is probably still my favourite game in the series, followed closely by the HeartGold remake on DS. I just hope I'm able to get myself a PokeBall Plus, I don't want them to be as rare to find as the Pokémon GO Plus was back at its launch. I love that it comes with Mew out of the box! @peanutbuttercup hit that pre-order now as i have a feeling they are goign to sell out and old Nintendo will be all surprised. Cool as this accessory is, I'm not sure if it's for me. @rjejr Then your wife must be stunning! @YANDMAN I would if I could. Canadian retailers don't have any pre orders up yet. The waiting game kills me everytime. I'd buy Pokemon if you could just play with a pro controller from your couch? @Fandabidozi It is already has been nearly impossible to pre-order one of these unless you were the type of person who waited around for them to be announced and pre-ordered it within the first hour it was available. Unless Nintendo gets on it this can quickly become an overpriced scalper item that only a select few will be able to enjoy, I imagine most of them will just sit around waiting to be bought for way too much money. The sad thing is that because of this I doubt any kids will ever be able to enjoy it if they have shortages, it will probably be mostly bought by adults who have the funds to buy it from a scalper or the ability to have pre-ordered it immediately. I don't think this is how Nintendo intended it to be used, but it is the fate of all novelty items that have supply shortages. Luckily I have seen the pre-orders bounce back recently so hopefully they remain available, I guess only time will tell. @JayJ That's not completely true in my case. I walked into GameStop last night and had no problem securing a pre-order - although it was for a game/Pokeball bundle. The guy said they had a lot left to fill. I do suspect the pokeball alone could be harder to pre-order.